SILVER SHIMMER BATH ACCESSORY SET by Accent Plus home decor, jewelry, decor, decorations, electronics, fountains, floor mats, art glass, vases, garden essentials, fireplace screens. 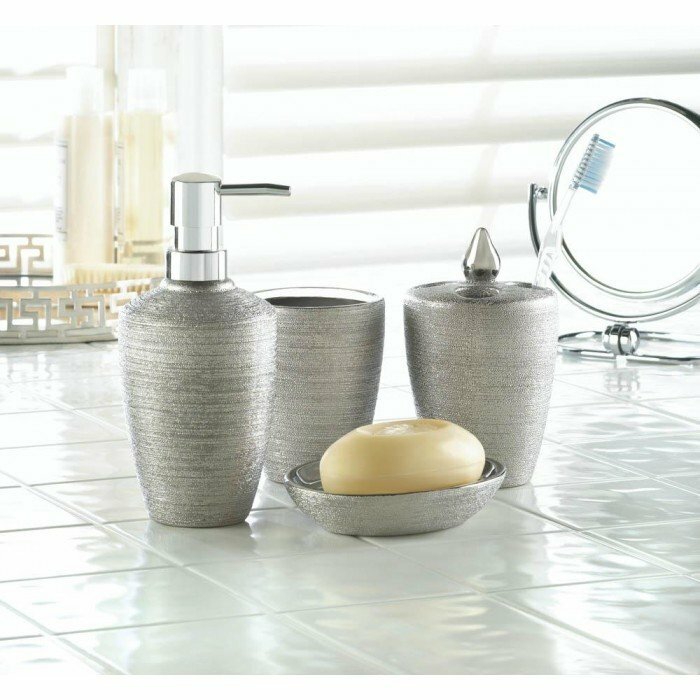 Make your counter sparkle and shine with this luxurious bath accessory set. You'll get four fabulous and functional porcelain pieces to make your bathroom ultra stylish. It comes with a liquid soap dispenser, four-slot toothbrush holder, cup, and oval soap dish. Lotion dispenser: 3 3/8" x 3 3/8" x 7 3/8" high, tumbler: 3" x 3" x 4" high, toothbrush holder: 3 " x 3" x 5" high, soap dish: 5" x 4" x 1 1/8" high. Material(s): PORCELAIN. Weight 2.86 pounds. Dimensions 3.38" x 3.38" x 7.12".